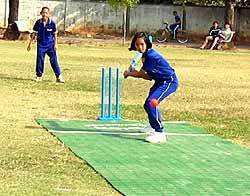 Junior cricket in Chiang Mai has come a long way since it started four years ago. Popularity is making people sit up and take notice of this activity that is played by both boys and girls from as young as eight or nine years until (as in David Buck’s case) eternity! Whoever says girls can’t play cricket? Just come and try out! Tesco Lotus has been following the progress of cricket here in Chiang Mai, with the Senior Vice President of Corporate Affairs, Justin Barnett, paying a visit during the Chiang Mai Sixes last year to see the set up for junior cricket. With the co-operation of Justin Barnett and his Store Directing Manager at Hang Dong, Matee Intrajak, we are delighted to report that exhibition cricket will be played in a section of the car park area at Hang Dong Tesco Lotus on Saturday 5, Sunday 6, Saturday 12, and Sunday February 13, 2005 from 2 p.m. until 5 p.m. These sessions will be carefully supervised by a qualified cricket coach, in a protective netting area. Any child wishing to come and watch, or participate in the ‘Cricket for Beginners’ competition, will be warmly welcomed. For further information on these sessions, please contact Linda Buck on [email protected] info.co.th or telephone 07 191 3807. 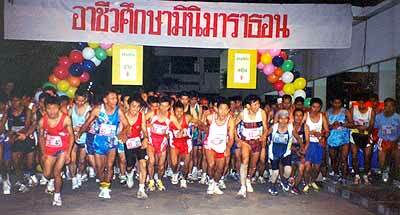 To celebrate its 72nd anniversary, the Chiang Mai Vocational College held the 2nd mini marathon in Chiang Mai on January 30, 2005, to encourage students and people to exercise. Sumaree Juljerm, Vocational College Committee Office, presiding over the opening ceremony explained that the mini marathon began in 1994. Runners at the mini marathon. There were two activities: the 10.5 kilometers mini marathon on the canal path outside town, and the walking for good health on the three kilometer road in Chiang Mai. Some of the income from the mini marathon will be used to provide educational equipment for students of the college. The mini marathon received a good response from teachers and students from the college, professor and parents club, the alumni club, the runners club, government and private organizations in Chiang Mai and other nearby provinces. Painting each other red, rather than the town! Chiang Mai is starting to feature more attractions suitable for the younger generation. 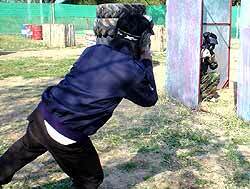 One such is the newly opened Chiangmai Paintball Club on the highway close to Kwan Wiang Village. Despite looking like a war zone, it is a very physically and even mentally challenging game which will soon be known to the youth in the Northern area. The desert-like site, which has a protective perimeter net for stray shots, features a 40m x 80m play area, suitable for paintball and air-soft battles for up to 20 players. It also contains a wide selection of obstacles to hide behind to make the battle more exciting, including barrels, boxes and stacks of tires. The fee for an individual person to play a round of paintball is 350 baht and includes course fee, gun rental, gas, a protective vest, camouflage suit, gloves, a full-face mask and 50 paintballs. Additional paintballs cost three baht each. All paintball guns are imported from the US. The paint is a non-permanent, oil-like substance, contained within a small plastic casing which bursts open on impact. No air-soft guns are available for rental but the course is open to owners of air-soft weapons. The range also offers a package with transport and refreshments. Although there is no age restriction, younger players will need to be accompanied by an adult in order to play. If it is desired, some course staff will suit up and provide moving targets if the children are too young to shoot at each other! Being hit by a paint ball at a distance closer than seven meters will result in bruises, and is deemed dangerous and should not be done. The field is open for use daily from 10 a.m. to 6 p.m. For more information call Asa Chantaworn at 06 700 0168. The first division of the Education Office in Uttaradit was the host of the Youth football championship matches between students from 15 Northern provinces. 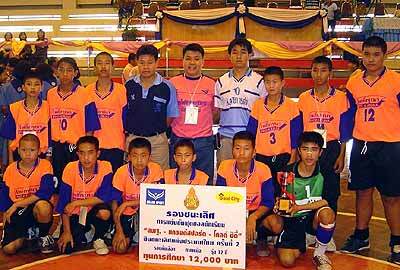 The games were played at the Uttaradit Darunee Sport Center from January 23–27, 2005. 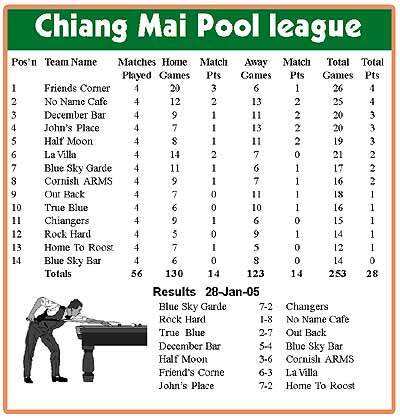 Chiang Mai’s 12 year olds became vice champion. The champion of the football league 15 year olds is the team from Phitsanulok province, with Phetchaboon second prize losing the final 4-2. Third place was held by Uttaradit scoring 4-2 against Nan province in the semi-finals. The champion for the 12 year olds was again Phitsanulok from Chiang Mai and Phetchaboon. All six winning teams will represent the northern region to compete in the national league with other regions for the second Princess Sirindhorn cup. Rujira Premmanon, director of the Sport Center of Thailand in Region 5, inspected the Chiang Mai Stadium after the tennis match between Venus Williams and Maria Sharapova in early January as it has not been improved since the 18th SEA Games that were held in 1995. She will ask for approval of the 14.8 million budget from the government to proceed with the restoration project. The draft budget includes 2.8 million baht to be used for the public address system, 2.6 million baht for the electricity system and 9.4 million baht for the Main Stadium Building covering lavatories, murals, developing the view and repairing damaged floors.